Born and raised in New Hampshire, Jason worked in an administrative capacity for an advertising company before being offered a position as an agent with CashOutATimeshare.com, LLC, so he pursued his real estate license and went to work, transacting over 500 sales in the past 5 years, with over $4.5 Million in proceeds to Sellers. Jason is professional, and takes great care of his customers, keeping them informed of the status of their sales transaction, going the extra mile to solve problems if they arise. He sells all timeshare properties, but specializes in Starwood, specifically Ka’anapali, Disney Vacation Club, and Marriott resorts. Jason has a wonderful and lovely fiancée and a 3 month old son who make every day a blessing. 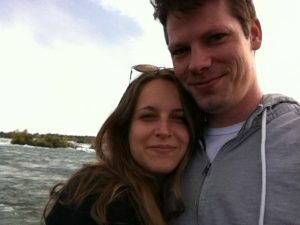 His fiancée Ashley is pictured with him during their visit to Niagara Falls. A humble person not too keen at tooting his own horn, Jason took the opportunity to pat us on the back during his interview for our article, “I’d like to thank you for your work and professionalism. I love working with you because of your attention to detail and excellent communication, qualities that can be difficult to come by in the timeshare world”. Thanks Jason for your confidence in our services; we look forward to a long working relationship over the years to come!